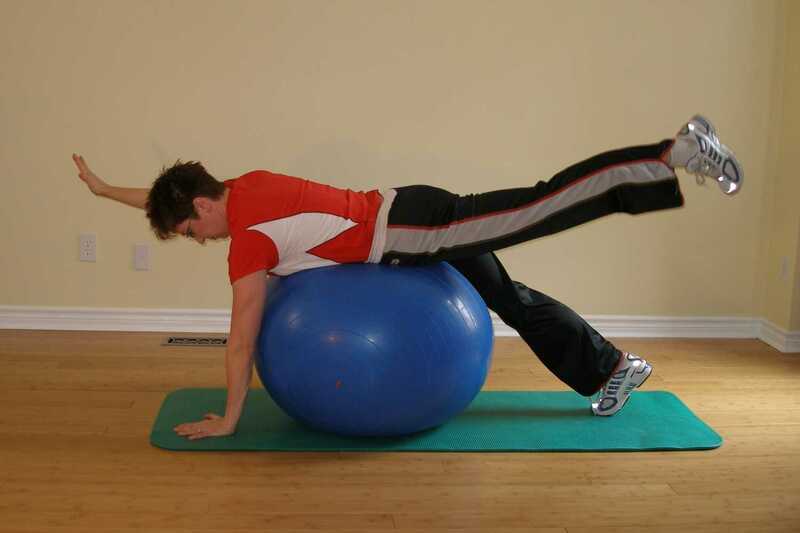 Start the superman exercise on the exercise ball by lying prone over the ball with your waist line centred over the top of the ball, chest slightly raised. Feet rest on the floor behind you about shoulder width apart. Set your abdominals and tuck your chin in before you move anything. Raise one arm in front of you to shoulder height. At the same time, raise the opposite leg. Lower your hand and foot to the floor. Glutes, hamstrings, back extensors, deltoids and scapular rotators. Be sure to keep your neck straight, chest up, and chin tucked to avoid neck injury. Keep your elbows and knees straight. If you find this too difficult, try raising alternating arms alone and then alternating legs so that you always have three points of stable support. Attach resistance bands to ankles or hold a light resistance band in your hands. Get rid of your exercise mat. If you are feeling unsteady lifting your alternating arm and leg at the same time, lift your leg straight out first, gain your equilibrium, then lift your arm. Hold this for 5 seconds. If you feel your ball is rolling away from you try letting some air out of your exercise ball and/or putting it on a soft exercise mat. This creates a more stable surface and lessens the challenge. As you improve you can add some more air into the ball and start using it on a harder surface. This is a great exercise to work on if you are trying to prevent back pain. It forces you to use muscles that are often inhibited as we sit at desks all day. The scapular rotators, rotator cuff, posterior deltoid, back extensors, and the gluteal muscles are often underused in most sedentary occupations. Click here for more about back exercises. Repeat this ball exercise 6 times on each leg. Repeat this ball exercise 10 times on each leg. Repeat this ball exercise 15 times on each leg.